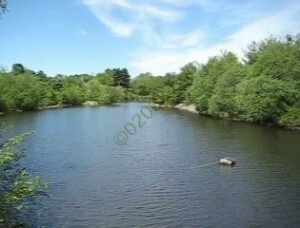 Spruce Pond Village is a beautiful townhouse condominium community situated in Franklin, MA just off Exit 16 of I-495. 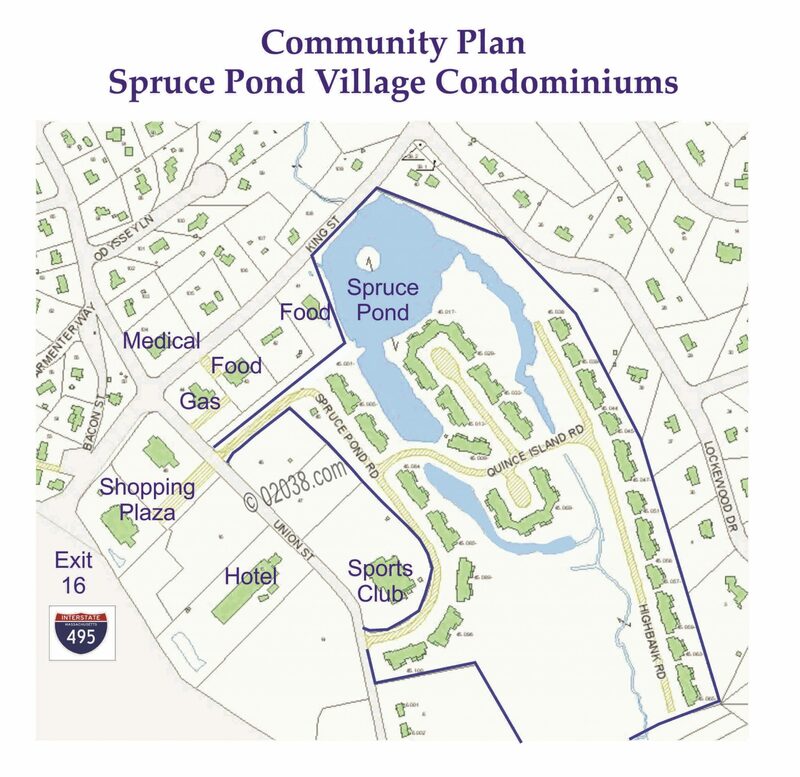 Residents of Spruce Pond Village benefit from its strategic location close to Exit 16 of I-495. That’s a boon for commuters! 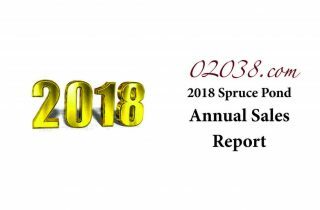 That strategic location has provided a cluster of several shops, eateries and a gas station very near to the Spruce Pond community. 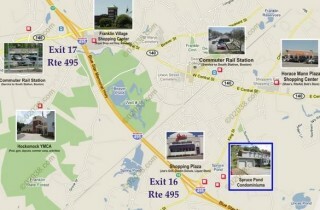 You’ll also find a plentiful supply of top-quality shopping on Rte 140, within an easy drive from Spruce Pond Village. That includes Horace Mann Plaza, home to a Shaw’s Supermarket. There are even medical offices very close to Spruce Pond! The two commuter rail stations in Franklin are also just minutes away. 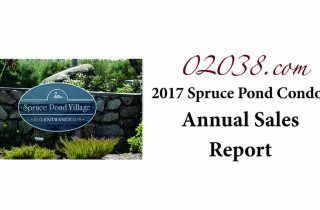 There are about 100 townhomes and ranch-style condo units at Spruce Pond Village. It was built between 1986 and 1988. 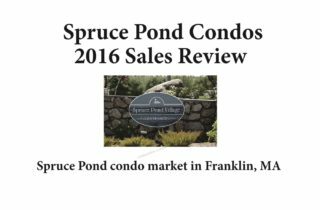 One distinctive feature of this condo community is the many pretty water views enjoyed by homes there; the community was built around portions of Franklin’s Spruce Pond. 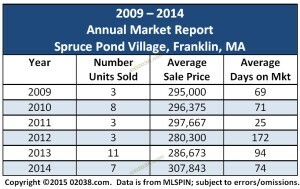 Townhouse units are frequently for sale at Spruce Pond Village. The ranch-style homes are fewer in number and accordingly are less available. 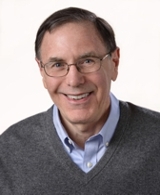 Gives an introductory overview of the condo community. Many townhomes at Spruce Pond Village enjoy pretty water views. 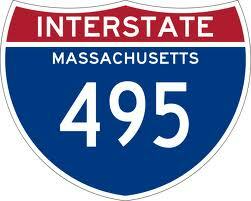 Exit 16 on I-495 is just seconds away from Spruce Pond Village. 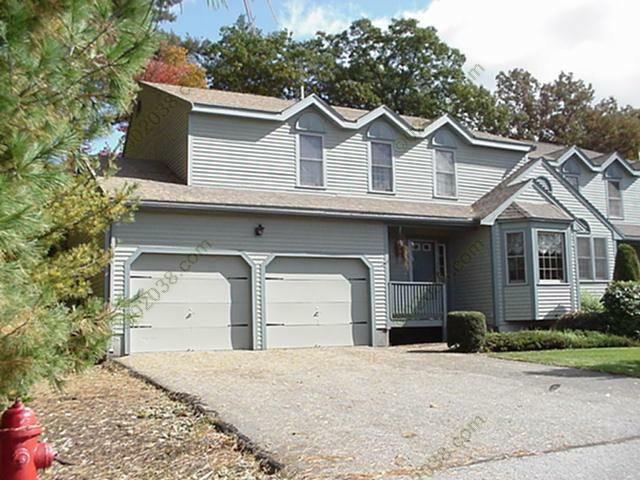 Spruce Pond townhomes offer 1 or 2 car garages. 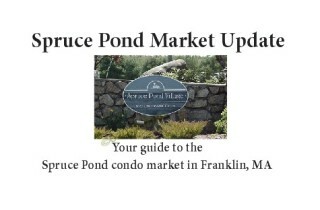 Spruce Pond Village enjoys ready access to shopping and restaurants.